Hi guys, TGIF! The past few days I've been at a scientific conference, and they have been long days. I can't wait to relax this weekend and try to recuperate from a hectic week here. Since I've last posted, Frenzy Polish has closed their shop for a few days to catch up on orders. No worries, she'll be back soon. 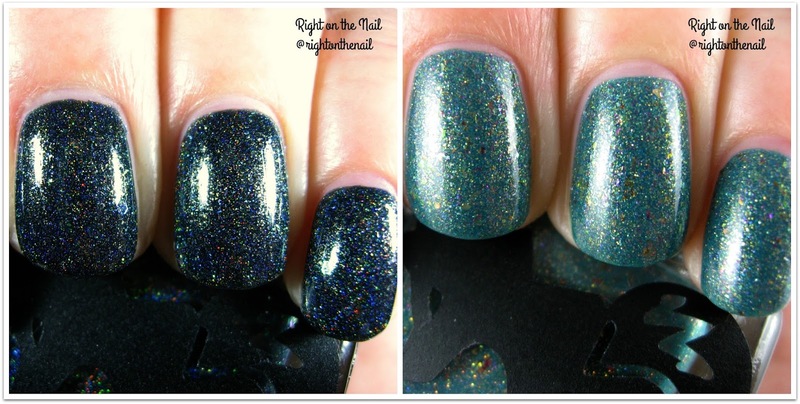 In the meantime, shall we admire some polishes from the Fall Out Foxes collection? For these swatches I decided to display the holographic finish instead of the flakes hiding in the background. If you look closely, you can still see the iridescent flakes within the deep blue color. Tres chic! It basically applied itself in 2 coats. I don't think I've hidden my love for multichome flakies. You can just imagine how fast I snatched up This Ain't a Scene. It's a medium teal with a crap ton of the flakes and gold shimmer. I just love how complex this polish is. Again, I have only positive things to say about the formula and application of the colors from Frenzy Polish. Most polishes retail for $9.50 and members of the Frenzy Foxes Facebook Fan Group do get access to special custom polishes if you are interested. As I said above, they are currently closed, but they'll be back before you know it. Stay tuned for more from Frenzy Polish!